It's hard to believe that the countdown to opening day has begun! 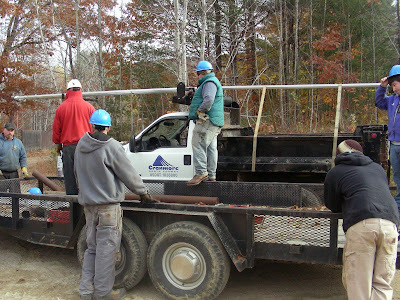 And this being "crunch time," Cranmore has been super busy preparing for the upcoming season, and opening day... December 5th! 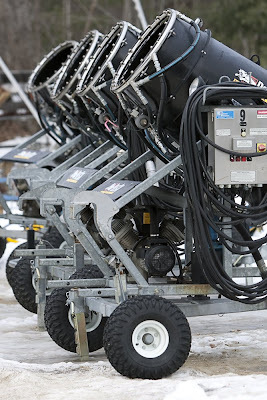 Whether they are hiring for the upcoming season, installing snow guns, welding and revamping terrain park elements, or planning this season events and marketing the mountain, it's safe to say EVERYONE here at Cranmore has been plenty busy! 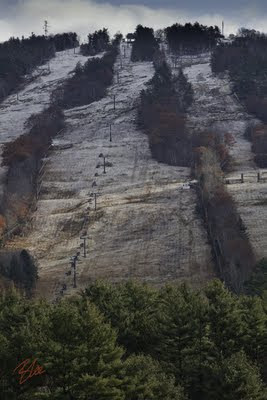 It seems that everything is starting to fall into place...now we just need the Snow! 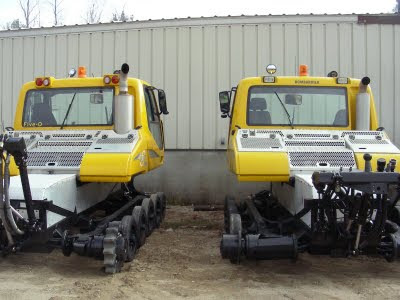 Above, the snow cats (groomers) are arriving back to their winter home and are ready to prowl the mountain. 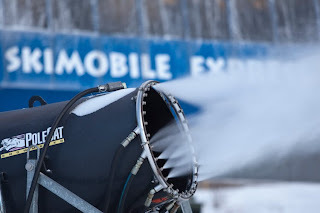 The snow making crew has had their hands full moving snow guns around the mountain, and installing the 80 brand new snow guns as they arrive to the mountain! 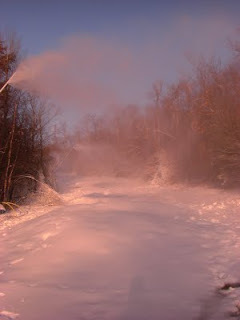 Below you'll see snow making pipes ready to be installed on the South Slope. The Darkside staff has has also been busy painting and making sure all of the park elements are ready for winter shredding (weather depending, Lucky Loop will be open Thanksgiving weekend with some rails and boxes set up for some preseason jibbin!) Check out there newly designed website! Ghoullog Opens to Rave Reviews! The Ghoullog opened this weekend and I can personally tell you that it is the scariest yet. I don't want to give away any surprises, but let's just say that the undead have taken over. That's right - zombies now roam the grounds of the Ghoullog. Lance Davis, head ghoul and leader of Death Becomes You Productions, shares that this year, Zombies are hot. Just ask anyone about Zombieland, the new movie that was #1 in the box office this last weekend. But that's not all that's new at Ghoullog this year. Be sure to check out the Demented Carnival. "That is sick, that is horrible. That is SO BAD," stated my new marketing coordinator Becca Deschenes. I have to agree. I mean, who would want to hurt little kittens and puppies? But it's all in fun and no animals will be harmed, we promise. But don't go in that vintage Airstream trailer where the carnies hang out. And definitely do NOT talk to that crazy clown guy. This is the third year of the Ghoullog and we have found that Columbus Day weekend tends to be the busiest. So if you are coming up for leaf peeping (and the leaves are just about at peak as of today) then be sure to reserve your tickets now as Saturday and Sunday nights are sure to sell out. Mountaintop House of Horror - the Ghoullog! Hard to face it, but Labor Day is behind us and summer is over. But good news - the Ghoullog is returning to Cranmore, and can ski season be far behind? The Ghoullog. for those of you in the dark (get it? in the dark?) 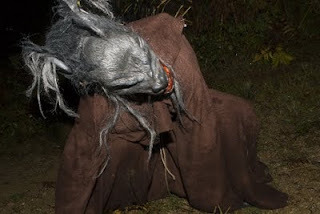 is New England's only mountain top haunted house. We're going into our third year and the guys at Death Becomes You Productions, our partners in grime, are telling me it's truly going to be the scariest one yet. For starters, they've added a Demented Carnival to the festivities that take place in the base area. Play games you can't win, like the knife catch and the kitten toss (don't worry, no real animals will be injured, we promise). And also new this year, the haunt has been expanded to include a whole new area at the start of the haunt, before you even get on the lift. If you've come in previous years, don't worry, you will be surprised and frightened at every turn once again. Tickets are already selling briskly especially for our popular Local's Nights with $19 tickets for Carroll, Coos and Oxford county residents. Buy yours online at www.cranmore.com/ghoullog today as dates do sell out. And for those of you from out of town, check out our new haunt and stay packages with area hotels and motels. See you at the Ghoullog! 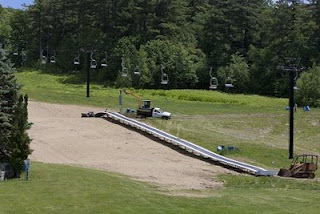 We are working hard here at Cranmore to prepare for the July 1st opening of the Tubing Park and Fun Zone. It's always fun to see construction photos on the mountain so I wanted to share with you these photos, thanks to our good friend and photographer, Bill Lee. 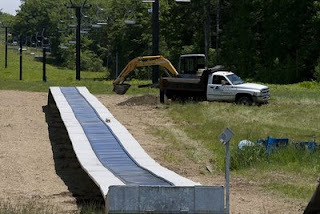 Here's the magic carpet lift, installed at the base of the South. This shot gives you a sense of its placement on the Slope. 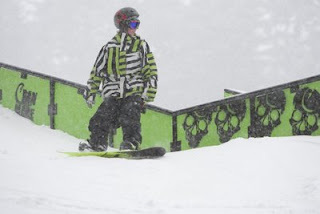 Check out those newly painted South Chair towers - love the new black paint! Another angle showing its placement on the South. 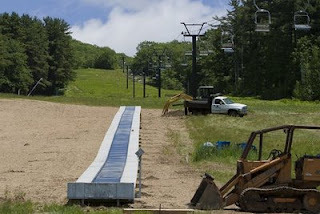 The tubing lanes will go on skier's right of the Carpet. 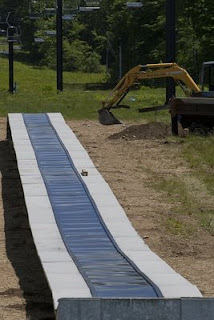 Happy tubers will ride this Magic Carpet lift to the top of the new tubing park and then slide down on the special Neveplast tubing surface. You will also access the Disc Golf Course from the top of this lift. Don't worry, we are installing a hand rail on either side and we've planted grass where you see dirt here! And here is the scope of the entire park area. The Fun Zone will be set up at the bottom of the South along with a snack shack where you can also buy tickets. 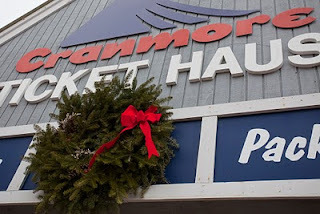 Speaking of tickets, our summer e-store is up and running so check in, buy your tickets and be ready for fun in the sun at Cranmore for your summer vacation! Is there anything better than music outside on a warm summer night? We don't think so! That's why we are expanding our summer concert schedule to include two new shows! 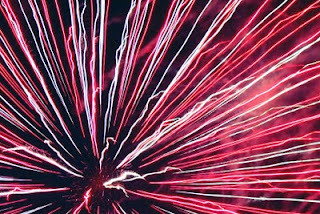 These shows are both on Thursday nights, so when combined with the existing Arts Jubilee Shows on Thursdays, that means nearly every week there is a show that evening in July and August. The July 16th show features Portland-based Rustic Overtones. Formed in the early 90s, Rustic Overtones gained popularity with funky horn-infused jams and a rock solid, rock-ready style. In their years together, the band gained a passionate following with their high energy live set, tirelessly touring college campuses and local clubs up and down the east coast, sometimes playing close to 200 shows a year Their latest album, Light at the End, was released nationally by Velour Music Group in March 2008. Opening band Audio Kickstand is a Mount Washington Valley favorite. They cite musical influences including reggae, funk, hip hop, rock, groove, or bluegrass. July 30th headliners deSoL are the Asbury Park, NJ "rock band with the Latin soul" signed to Curb Records and touted as "up-and-comers" by Rolling Stone. This seamless blend of seven inspired musicians is a brotherhood whose heady, polyrhythmic mix of chanted melodies and mystical atmosphere embraces the contemporary edge of big modern rock hooks with flourishes of rap and hip-hop. deSoL’s vibrant and colorful live show – an infectious display that forces audience members out of their seats – has been pivotal in seeing the band earn praise in The New York Times, Boston Globe and New York Post. Opening for deSoL is New York based Evan Watson, an up-and-coming singer-guitarist now working on his first album release. Watson cites influences including Eric Clapton, Allman Brothers and Ben Harper. Both shows are only $5 per person entry, ages 12 and under free. These new shows were put together with the help and support of our friends at WMWV 93.5! It's official, folks. 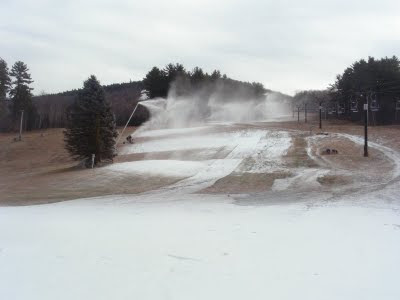 Cranmore is closed for the season. This moment is always bittersweet for me, the penultimate opposite of the excitement of opening day. On one hand, it is hard to see the grand old mountain with its patchy spring snow. You really appreciate what our groomers do once they stop doing their thing. The remaining snow degrades quickly. They don't call it grooming for nothing. Snowcats and snow machines are still zipping around the mountain as Cranmore's mountain ops team takes down all we took pains to build all winter. 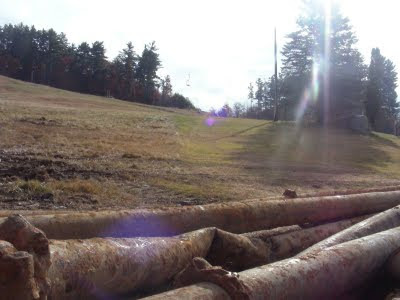 Terrain park elements are removed. Food venues are cleaned and closed. Signs are taken down and turned off. But some things remain the same. Cranmore's resident geese honked me a very good morning greeting today. They're not going anywhere. And neither is the small crew of us who remain here year round. I am already working on plans for this summer and next winter. 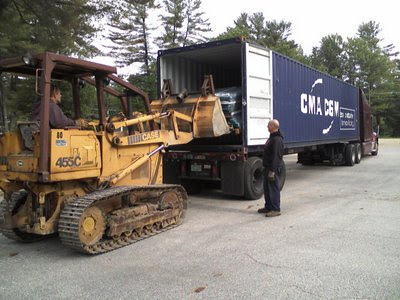 We are busily rounding up photos and content for the next issue of Cranmore North Conway Magazine. And stay tuned for news on a new summer concert series that will be in addition to the Arts Jubilee concerts we already host. 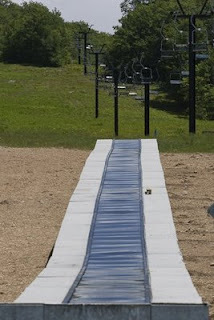 And believe it or not, Threedom Passes and Cranmore Happy Trails passes are already for sale for NEXT winter. If you're counting pennies like many of us, you'll want to save the money and buy passes early before prices increase. 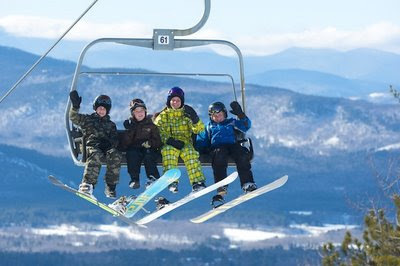 Kids passes are just $149 for Cranmore season passes, ages 6-12. What a great Easter Basket gift idea! 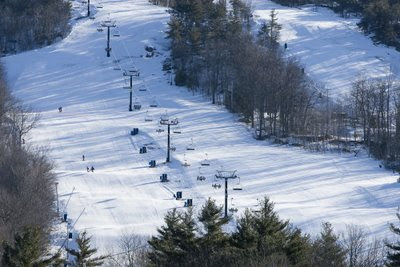 Cranmore's sunny locale and wide open slopes makes for long bright days skiing this time of year. The good news is that the warm days are followed by cold nights, allowing the snow to firm up again. I skied for a few hours today and my picks were anything in the East Slope area (East, Schneider) and Artist Falls. All are good picks earlier in the day when the snow is still firm. 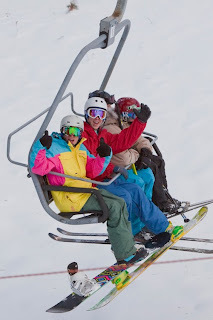 Plus, it gives you an excuse to ride the classic East Double Chair, the oldest operating double East of the Mississippi! Try out trails with less exposure later in the day when the air temp warms and softens up the snow. In case you are wondering, our projected close date is March 29, so we have two more weekends left. While we still have a boatload of snow, the downside of all this sunshine is that spring does eventually take its toll. So after the 29th, it's time to move on to other pursuits, whether it is skiing at other mountains with a higher elevation or northerly orientation, like our sister resort Waterville Valley. Or time to dust off those golf clubs and head south. I hear you can actually see the ground down in Boston. Imagine that! There's a reason why Cranmore has a reputation as being a great early spring mountain and I have the sunburn to prove it. 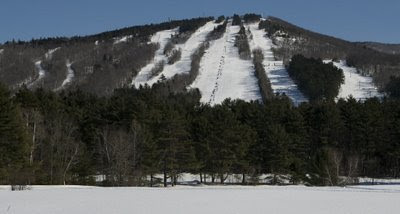 I did not heed my own good sunscreen advice before going out to watch yesterday's fabulous Meister Cup Race at Cranmore. Sunglasses anyone? We are still 100% open and conditions have turned to corn, or in the vernacular, that would be "mashed potatoes" or as others call it, hero snow. We've let Ledges bump up and they are a joy to fly through, as forgiving as they are. We still have excellent coverage although on some areas with underlying ledge, direct sunlight or heavy traffic might have some dirt or rock surfaces poking through. You'll also want to wax your skis as sometimes the wetter surfaces can slow you down. But in looking at this week's forecast, there's an off-and-on weather of various types then colder temps returning. What's good for maple syrup is good for skiing - cold temps at night and warm temps during the day. Are pancakes in order? One of the pleasures of my job is working with many excellent photographers. We've recently completed working on several different shoots as well as our daily efforts for our CAM shots and of course, our blog. 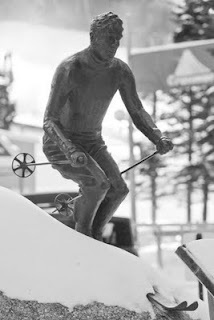 This photo is from the shoot we did with Rob Bossi who works with many major ski areas throughout the country. I've been managing photo shoots for many years but I learned a boatload that day working with him, and the results are spectacular. 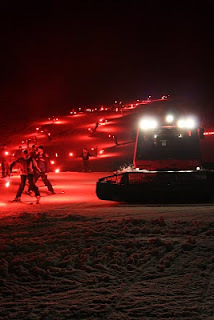 We also welcomed back John Webster to photograph our terrain parks after the terrific work he did for us last year. 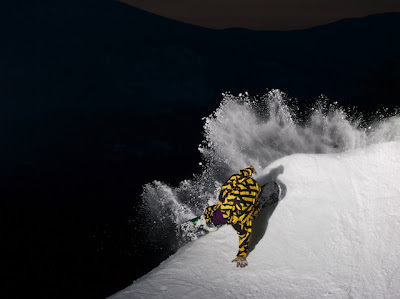 His photo shoot added new meaning to the term "Darkside" as he and Jess Richitelli and crew shot at dusk and after sunset. Thanks John! Last but not least, North Conway denizen and "snow-ga" practician Bill Lee has faithfully provided photos for this blog, in addition to a fun shoot we did last fall for the Ghoullog. He has a gift for capturing that special sense of place that makes Cranmore North Conway's gem in the heart of the Presidentials. I just love this rock on the North Conway trail, don't you? There's still plenty of skiing left in March. And as you may know, March is the snowiest month up here. Don't let this tease of spring weather fool you. I'm not putting away my shovel just yet. We're hosting the Buddy Warner races next week which will bring hundreds of racers and their families to our sunny slopes. Be sure to join them here at Cranmore! I am running out of hyperbole for snow conditions this winter. We got another foot of snow Sunday night, adding to the foot we got on Thursday. Today was another blue bird beauty and the combination of sunshine and powder was irresistible. I went out with sales manager Krissy Fraser to do some product testing, you know, all the better to tell the many boy scout troops who come to our mountain every weekend. Here she is at the bottom of Jughandle, which was chock-a-block full of pow-pow. Yummy! Next came a run through Red Pine Glade to Ledges, which was unexpectedly left ungroomed for a change. Don't let anyone tell you Cranmore lacks challenging terrain - this steep beauty left my heart beating fast as I finished up the run. Sweet! 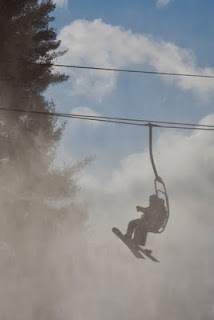 And is there anything better than a run down the East Slope to the classic East Double Chair on a sunny day? You can still find untracked powder on skier's left on lower East. Speaking of untracked powder, I skied as many glades as I could today - Beech, Treemeister, Black Forest, Pipeline - all wonderful, all full of stashes of powder still today, 48 hours post-snow storm. This week's forecast shows more fair weather which should hold up conditions nicely throughout the period. New Hampshire school vacation week is in full swing. Grab a few days in the winter sunshine snow while you can! I spent just about all day yesterday on the mountain and had the pleasure of skiing nearly every trail. I am happy to report that Cranmore's groomers are miracle workers and the mountain has rebounded in spectacular fashion from last week's precipitation event, or as some of you call it, the "R" word. 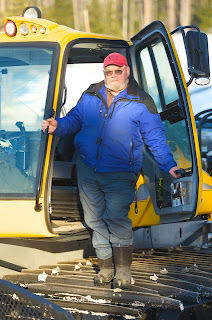 Saturday night I went for a ride down and around the mountain with Snowcat Johnny, Supervisor of Cranmore's grooming and snowmaking team. 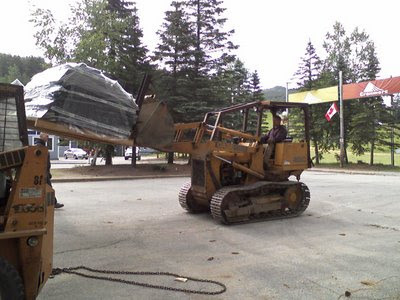 These massive machines with knowledgeable hands at the wheel till the snow surfaces the way a plow carves through soil. There is still a TON of snow out there, and with the right people at the helm like Johnny, the snow transforms to corduroy every night. And just to sweeten things up even more, Johnny and the crew hit several of our most popular trails with snowmaking last night, including Middle, North and South. When I came in from my long day on the mountain yesterday I saw for the first time the tell-tale sign that the sun is now higher in the sky than before - freckles and rosy cheeks from the sunshine on my face, which I did not have to cover in fleece and neoprene to survive my day outside. Time for sunscreen once again! 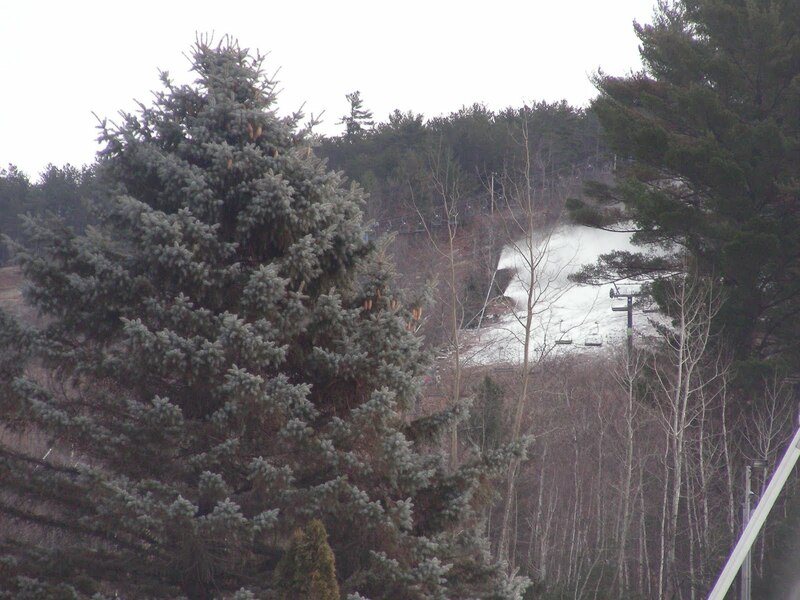 Break out the sunglasses and Tan More at Cranmore! For those of you who are fans of Facebook, do yourself a favor and after you add Cranmore as a friend, seek out the Cranmore Geese who have somehow waddled around and set up their own Facebook profile. I honestly do not know who set up this profile but the Geese have an uncanny ability to capture the true essence of a day at Cranmore. Break out the bread crumbs! Because I work at a ski area, I work with a lot of really, really good skiers and snowboarders. I know this sounds obvious but as someone who learned to ski as an adult, I am a little self-conscious about my skills, even though by most standards I'm not bad. I get to ski more days in a month than most people do in years. Considering I work with all these great skiers, and have access to lessons on a daily basis, one would think that I would have taken a lesson or two over the years. But in the 7 winters I've worked here I have rarely done so. That changed yesterday when I made a visit to the Sunday morning ladies' group that our ski school offers every non-holiday period. There were about a dozen of us coached by our ski school director Karen Dolan, instructor Sally Anderson and seasonal program coordinator Mary Miller. I work with Karen every day but had never taken a lesson from her. What a treat! All of us were intermediate to advanced skiers looking to move to the next level and improve our technique. Personally, I am growing fond of bump skiing and hitting the glades. I can make it through a mogul field or tree run, but it ain't pretty. Our first run together focused on getting forward and getting on edge. Like many other women in the group, my turns skid and put pressure on the tails of my skis. We practiced skate skiing on flat areas to build awareness of how your legs should extend on the turn and how keeping the skis flat on the snow slows you down. Next run was down the bumps on Schneider. Half way down, Karen stopped me and told me to aim for the snow, turn on top of the bump and drive my tips into the snow. "When you approach a bump, your skis point upwards, putting you in the backseat. By concentrating on pointing your tips down into the snow, you avoid this. 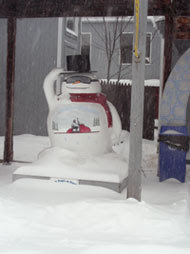 Keep your skis on the snow," Dolan instructed. I tried it and it felt totally different - much more in control. I can't wait to get out there later today to work on this some more! I also got advice on keeping forward - something I hear every time I have ever taken a lesson and something I should really work on. Feel your shin against the front of the boot; press down your big toe to initiate a turn; keep your feet hip width apart. 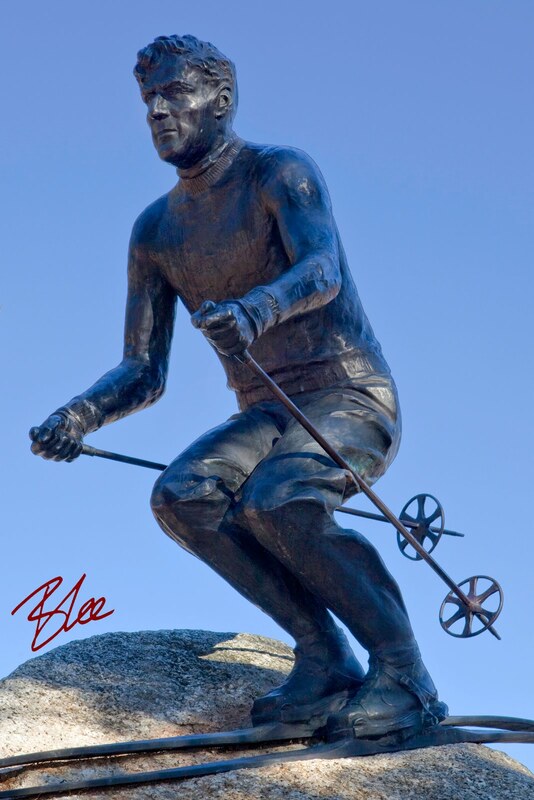 Cranmore has been a teaching mountain since Hannes Schneider came here 70 years ago. While we may not have the highest elevation or vertical drop in the state, we do have a ski school that can measure against the best in the country, and teaching terrain that can challenge all abilities. If you haven't taken a lesson in years or think you're all that, try taking one of our "Reach the Peak" group lessons for intermediates, or better yet, take a private lesson. The thrill of making progress after many years of status quo is worth the effort. 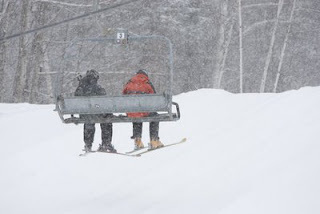 With the all-important February vacation week coming up in just a week, you might want to know what the straight scoop is for snow conditions at Cranmore and I'm glad to oblige. I skied for a few hours here both yesterday and today and hit a variety of trails to taste test the product. I'm happy to report I wasn't disappointed. I can't remember another year where we had so many perfect blue sky days and such beautiful packed powder conditions. No freeze thaw cycle here. In fact, no January thaw at all, and looking halfway into February, nothing ominous looks to be coming at us anytime soon. East Bowl to Gibson Pitch - Packed powder, great little lip at the bottom of Gibson Pitch down to lower East -- woopie-dee-doo! Arlberg to Jughandle to Bandit - Arlberg remains a cruiser's paradise as usual. Jughandle's powder has packed down to nice moguls. Look out for some ice and dirt on the backs of some of the bumps but you can easily fly through Juggie. Bandit's cool little banked turns are always a hoot. Red Pine to Ledges to Darkside - You need to pick your way through Red Pine Glade but everyone knows a little challenge is fun. Ledges is in as good a shape as I've ever seen it. 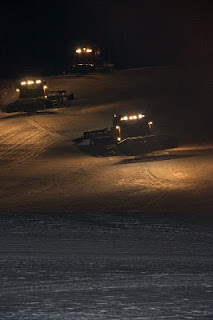 The Darkside - what can I say; the terrain park crew has been out there for weeks grooming and perfecting the best park in the Valley. 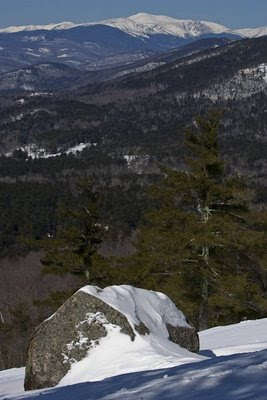 Skimeister to Bandit - Another of my favorite classic New England style trails on the north side of the mountain. Skimeister is a dream; cut over on Bandit to avoid the traverse by the condos at the base back to the Quad. East to Artist Falls to Oompah to South - This is fast becoming my favorite last run of the day because it's a cruiser that dumps right down to my office in the base lodge. Lovely views of the Moats and the Saco River Valley.